The story of St. Joan Antida Thouret (also known as Jeanne Antide Thouret (in French), Giovanna Antida Thouret (in Italian)), is a great inspiration to us, especially during this Year of Faith. Born on November 27, 1765 in France, Jeanne Antide was the fifth child of a family of eight. When she was just 15 years old, her mother died, leaving the responsibility of maintaining the family to Jeanne Antide. At the age of 22, after seeing a vision of hands reaching out to her through a cloister grille, Jeanne Antide decided to join a community that combined prayer, community living, and ministry to the poor. So at 22 she left her home and joined the Daughters of Charity. In 1793, when the French Revolution was at its height, all religious congregations were banned and Jeanne Antide was forced to leave the Daughters of Charity. All of the Sisters were disbanded and sent back to their hometowns. She returned to her home knowing she would carry on what she had learned from St. Vincent de Paul. She cared for the sick, the wounded, and the poor-– all of which grew numerous during the chaos of the French Revolution. Jeanne Antide also taught the children, helped the priests who were forced to hide, and gathered Christians in prayer. Because of her desire to commit herself to Christ and to her religious vocation, Jeanne Antide fled France and escaped to Switzerland to join a different religious itinerant community where she cared for the sick. With them she traveled across Switzerland and Germany. When she decided to return to France she did so on foot, alone, without a passport and through unknown places at the risk of her own life. Representatives from her diocese of Besançon, also in exile, made a request of her to continue on to France and take in young girls whom she should train in the same way she was trained. She accepted this request and in 1799 she opened a school, a dispensary, and a soup kitchen for the poor in Besancon. She had founded a new congregation. For further reading, visit this article in Vincentiana. In 1810 Jeanne Antide was called to Naples. There she and a group of sisters faced working in a very hierarchical social system where the wealthy never encountered to poor. Jeanne Antide was in charge of the Hospital of the Incurable, the largest hospital in the city. 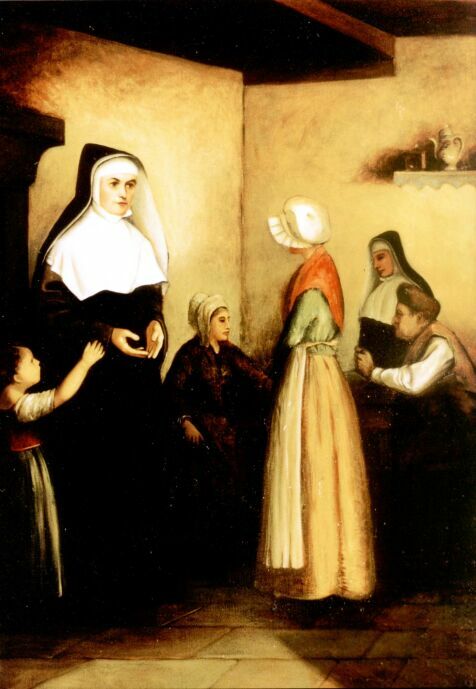 The sisters often visited the poor and sick in their homes. Jeanne Antide died in Naples in 1826. In 1934, Pope Pius XI declared her a Saint. This vow calls us to a “mutuality” with the poor. It is NOT an attitude of our being superior to the poor, rather it calls us to learn from each other and to live and work together to create a better society. Who nominated her a saint? I searched but could not find the answer to your question. I did find an article that said the date of introduction of the cause for her canonization was on 16 July, 1900; the promulgation of decree on heroic virtues was 09 July, 1922, and her beatification took place on 23 May, 1926.